The Sox acquired Scott Fletcher for the Cubs by threatening to take Fergie Jenkins. 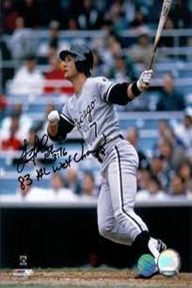 Fletcher would be a part of the 1983 divisional champion but his bigger impact perhaps came in 1990, for the ‘doin' the little things’ White Sox, who shocked baseball by winning 94 games. Fletcher was a defensive rock at second base and executed small things like bunting, hitting behind a runner, hitting to the opposite field and driving in key runs exceptionally well. Tidrow did just about everything a relief pitcher could do in 1983 and Dybzinski stabilized a shaky infield in the early part of that same season. Unfortunately his base running error in Game 4 of the ALCS is what he is best remembered for. The Sox starting staff was so deep in 1983, with seven pitchers on the roster who all won at least 10 games in a major league season, that Martz never really got a chance. He only made one emergency start that year in a game at Detroit.